My name is Mujyambere Abdoulrahim. I am a twenty-four year old Rwandan born into a large family as the fifth of nine siblings. 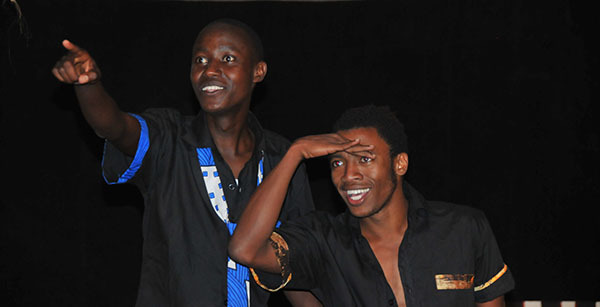 I have enjoyed acting since I was child, and I was given the opportunity to fully pursue this passion when Youth Bridge Global arrived in Rwanda in the summer of 2013 to produce Shakespeare's famous play Romeo and Juliet. I consider my participation in the play to be a significant moment in revealing my love and talent for acting. Later, I was selected among many other young Rwandan actors and I was given the role of Mercutio, and since then my dreams have turned into reality! I like the arts in general, and I have had considerable experience in dance. What I like specifically about theater is that it entertains the audience and it transmits a direct message to them in a clear and powerful way! I find this very interesting. Thus, through the power and communication of theater, I believe it is possible for a whole community to change! My country has known big problems throughout its history. I consider theater as a perfect tool to share messages of unity and reconciliation. To me, theater has no limits and transcends all kinds of conflicts whether they be social,political,religious or economic in nature. As a Rwandan actor, I have been granted a chance to participate in a professional theater training workshop provided by Shakespeare and Company in Lenox, Massachusetts in the United States, and I expect to develop many skills and techniques related to acting and theatrical expression. I believe these skills and this experience will change my life as an actor and community member. When I return to my home in Kigali, I will apply what I learned at Shakespeare and Company to help the people of my community and to change their lives for the better in different ways.